Posey Rorer was born badly club-footed which may well have influenced him to take up the fiddle as a youngster. Born in the hills of Franklin County, Virginia in 1891, his crippled feet would not allow him to run and play with his older siblings. Posey's father, W.T. Rorer, played old-time banjo a little and no doubt fired his son's desire to play string music. Posey made his first fiddle out of a wooden cigar box and began playing with his cousin and neighbor Bob Moore, an old-time banjo player. The two would often play dance music in the one- room log cabin where the Rorer Family lived. During World War I, Posey took a job working as a trapper in the coal mines of Big Stick, West Virginia. It was there in West Virginia where he encountered the free-spirited, rambling banjoist Charlie Poole. The two became brothers-in-law in 1920 when Poole married Posey's older sister, Lou Emma. In the early 1920's Posey was freed from his club feet by surgery at Johns Hopkins Hospital. The surgery was paid for with money made from a run of moonshine whiskey. Rorer began playing more dances and shows with his brother-in-law. Rorer and Poole, along with guitarist Norman Woodlief, went to New York City in 1925 on their own initiative to try to record. Their recordings, released as "Charlie Poole with the North Carolina Ramblers", were smash hits. Rorer's reputation as a smooth mountain fiddler led other musicians to seek him out as a back-up fiddler for their recordings. Between March of 1927 and February of 1928 Posey fiddled his way through six different recording sessions for Victor, Columbia, Gennett, Paramount, and Brunswick Record Companies. Posey accompanied Kelly Harrell, Roy Harvey, Bob Hoke, and of course Charlie Poole. Early in 1928 Rorer and Poole split. Posey went on to record with two Stokes County, North Carolina singers: Matt Simmons and Frank Miller. 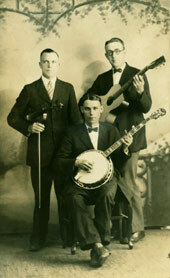 They recorded for Edison Records in the fall of 1928 as "Posey Rorer and the North Carolina Ramblers". In the years 1929 and 1930 Posey recorded with Walter "Kid" Smith for Gennett, Columbia and American Record Companies. The records were issued as by "Smith and Woodlieff", " The Carolina Buddies" and "The Dixie Ramblers". A few weeks after Poole's death, in the spring of 1931, Rorer entered the recording studios for the last time. Posey along with banjoist Buster Carter and guitarist Preston Young, cut ten sides for Columbia including the very first recording of "I'll Roll in My Sweet Baby's Arms". Rorer followed Poole in death five years later, at age 44. He was found dead in the Spray (North Carolina) park where he and Poole had so often played together in happier times. Rorer left a fine legacy of traditional fiddle tunes, still revered to this day by fans of old-time music. Many thanks to Kinney for writing this article.